The plant is restricted in some countries because it carries a risk of toxicity and should be used only under the guidance of a knowledgeable herbalist. Some experts warn against taking feverfew along with such blood-thinning drugs as aspirin and warfarin (Coumadin), antimigraine drugs, high doses of vitamin E, ginkgo biloba, calcium channel blockers, and ticlopidine (Ticlid). Since feverfew has a mild anticoagulant effect, combining it with anti-clotting products may result in bleeding problems. Native to southeastern Europe, feverfew is now common throughout Europe, Australia, and North America. Tansy is found throughout the temperate zones in the northern hemisphere, growing in open areas, along roadsides, and close to water. Both are herbaceous perennials growing to two or three feet in height and producing numerous strongly aromatic, clusters of yellow, daisylike flowers. They also have an erect stem and feathery compound leaves. 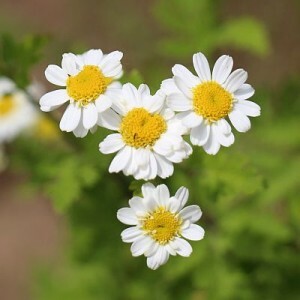 Feverfew is a close relative of chamomile and is often confused with chamomile; but, unlike chamomile, whose flowers contain medicinal oils, the therapeutic ingredients of feverfew are found in the leaves. The leaves are picked as required, while the aerial parts, as a whole, are harvested in summer when the plant is in flower. The name feverfew is derived from the Latin term febrifugia, which means to “drive out fevers”. The use of feverfew as a migraine remedy is credited to the wife of a Welsh doctor. It is said that she ended her 50-year history of such headaches with a course of feverfew. It has been used since Roman times to induce menstruation and given during difficult birth to aid in the expulsion of the placenta. Dioscorides, an ancient Greek physician, gave it to women during childbirth to increase uterine contractions and to speed the birth process. Culpeper stated, in 1653, that the main use for the herb was for women’s complaints. For centuries, it was used to lower fevers, treat infant colic, depression, vertigo, kidney stones, and constipation. It is also used as an insect repellent and to treat minor skin wounds and to relieve the pain of arthritis. Although not mentioned in surviving classical texts, tansy was described by medieval herbalists, notably Hildegard of Bingen in the 12th century and onward. It has since been the most common worm-expelling plant used. Gerard also wrote that feverfew was an effective headache remedy. Cotton Mather, an American clergyman and writer of the 1700s, recommended chewing feverfew to ease a toothache. A detailed scientific investigation in Britain, in the 1980s, demonstrated its effectiveness for migraine headaches, reducing the number and severity of these attacks, as well as the degree of vomiting that often accompanies the condition. They found that parthenolide works against migraine headaches by reducing blood platelet activity and the release of histamines and prostaglandins, body chemicals that are instrumental in the inflammation and sudden widening of the blood vessels in the head. It also helps prevent the fluctuations in levels of serotonin, another chemical that is instrumental in migraine symptoms. These substances and effects may also explain the herb’s ability to reduce menstrual cramps and to relieve arthritic pain and inflammation. Feverfew seems to be more effective as a preventative rather than relieving full-blown symptoms of migraine headaches. While the vomiting and other symptoms were milder, there was no change in the duration of the headaches according to one study. It should be noted that the quality of many commercial feverfew products is very uneven. Some lab analysis found little or none of the active ingredient, parthenolide. As a preventative for migraines and as an alternative to taking pills that may have little or none of the active ingredients, it is recommended that chewing two or three of the dried leaves per day would be a better choice, although regular use can cause mouth ulcers. At such times, it would be best to switch to a tea. Feverfew can be a mild sedative and euphoric and is occasionally added to compounds for the relief of nervous tension. In large doses, it can sedate those suffering from nervous hysteria, but may produce some side effects. However, moderate doses are completely safe. Strong teas made from the leaves are used to treat skin inflammations and minor wounds.